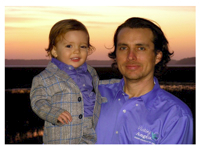 Richard DeSalle of Bluffton and Keith Weinman of Hilton Head Island recently opened Visiting Angels, a local agency serving Hilton Head Island, Bluffton and Beaufort, S.C. areas. DeSalle and Weinman, along with their team of certified nursing assistants provide in-home care, respite care, senior personal care, elder care and companion care so that elderly adults can continue to live independently in their own homes. For Weinman, in-home care was always a way of life, as his mother was the primary caregiver for his grandparents. 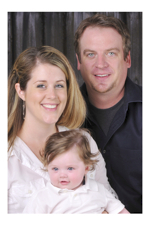 When Weinman’s mother fell ill in 2011, alongside his family, it was his turn to help out. “While we are fortunate to have family in the area to give support, it hit home that there are so many others living in our community without family nearby to help,” he said. 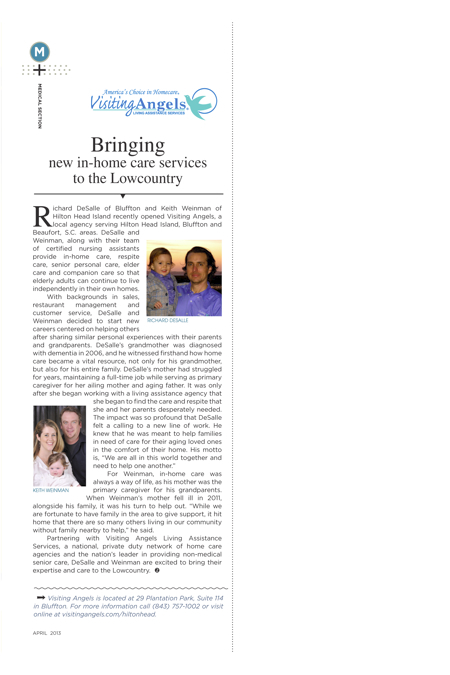 Partnering with Visiting Angels Living Assistance Services, a national, private duty network of home care agencies and the nation’s leader in providing non-medical senior care, DeSalle and Weinman are excited to bring their expertise and care to the Lowcountry. Visiting Angels is located at 29 Plantation Park, Suite 114 in Bluffton. For more information call (843) 757-1002 or visit online at visitingangels.com/hiltonhead.